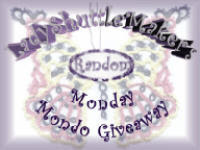 Check out Tatted Treasures dot com for details of a giveaway for a beautiful wooden shuttle made by David Reed Smith. I tried to link to the web page but it would not work. Blogger is so frustrating. Is anyone else having that problem? Has anyone tried Google Chrome? If so, do you like it? Is WordPress easier or better to use?